My spare time yesterday and today (like I am so busy! Not!) 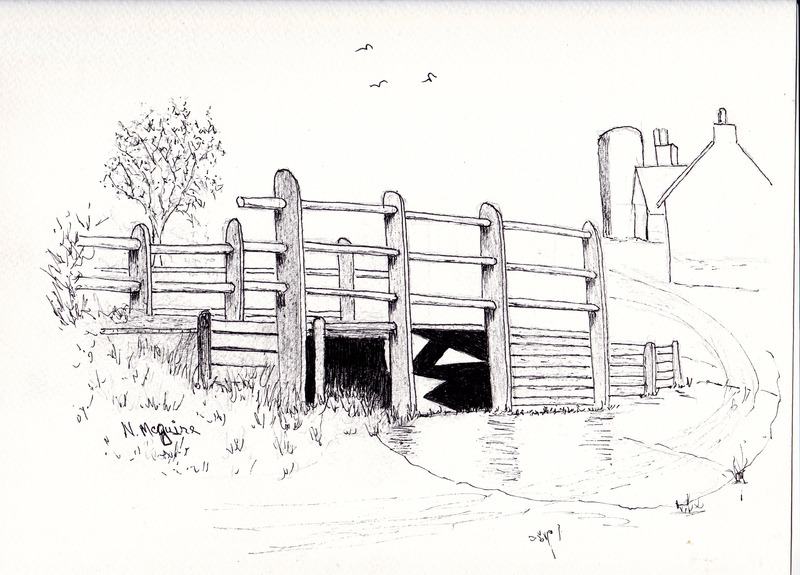 was spent doing a pen and ink sketch of an old bridge. I thoroughly enjoyed myself, all alone, just me, myself and I. A quiet time. It brought back memories of when I went to Point Grey Junior High School in Vancouver, many moons ago! I presume that in this day and age our little “Pen and Ink Club” would be called “Extra Curricular Activities” and if the teachers were to go on strike, no club activities. Back in my time at school, teachers didn’t go on strike. They had 35 to forty students in a class, but they didn’t have any students that had learning disabilities. There was no “bullying” back then, either. There has been so many changes… and not all for the good… but that’s a different story that I don’t care to get involved in. I was the only girl in that club. And I still love to do pen and ink sketches! Hi Norma 🙂 I’m the first fan of pen and inks – wonderful work today! Yup, time has changed. There’s Christie Clark who high jacked the ant-bullying Pink Shirt Day now head of a party running negative ads – also known as character assassination ops. It’s all too much for me. Loved my visit with you, btw. Hugs! Beautiful work. I always admired how you and Mickey were so good at art. I still cherish the picture that you gave Mac and I for a wedding gift. What a fine hand you have! Just beautiful. My grandmother did pen and ink sketching. My eldest daughter had a set of four framed and hanging in her living room for many years. When she moved from her house to an apartment, she gave them to her youngest sister, who is also an artist, working as a graphic designer in a print shop. Heather, Bev, and Judith, it is so great to have you dropping by for a visit. I do appreciate your comments. The kettle is boiling, so pull up a chair and have a cup of tea! I’ve Known Bev for many years, even watched her growing up, Heather has been a friend for quite a few years… Judith is one of my cyber friends. Isn”t it wonderful how we can be friends at a distance! you take a pen and ink and bring a picture to life . Lovely 🙂 Am I surprised ? Not at all ! Hi Kallie! Tea is ready, but we had to wait for some cookies to bake. I’m still waiting! I love finding your comment on my blog… because I love you, too! I love the sketch. Dad is very good at drawing as well. HI Philip! Do you have time for tea? Say hello to your Dad for me… the last time I saw him he was about 12 years old… a long time ago! Your folks and all the kids would visit Aunt Sadie and Uncle Russell (my parents) out on their little farm in Langley.